This week, we’re investigating the Millennium Prize Problems – a set of mathematical equations that, if solved, will not only nab the lucky winner a million, but also revolutionise the world. Plus, the headlines from the world of science and technology, including why screams are so alarming, how fat fish help the human fight against flab, and what’s the future of money? Better yet, the episode includes a contribution from our very own Katie Steckles talking topology, Poincaré and Perelman. The episode is available to listen or download as a podcast or, less conveniently, at 5am tomorrow on Radio 5 Live (or later on iPlayer). Not a listener? Read a transcript. 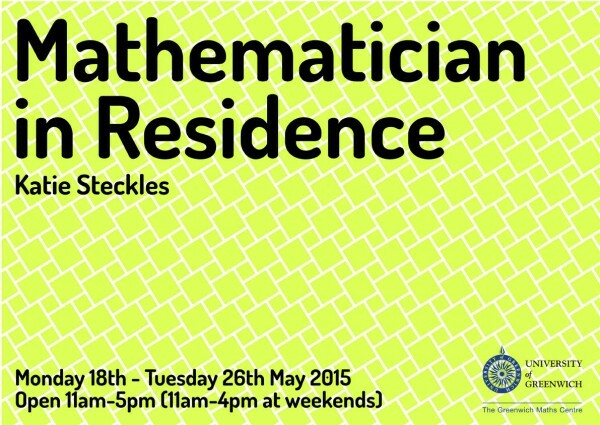 Our very own Katie Steckles is currently residing mathematically in the University of Greenwich’s Stephen Lawrence Gallery. She’s there until Tuesday the 26th, doing a variety of numerical, geometrical and otherwisely logical things for anyone who pops along. As part of our massive π day celebrations, The Aperiodical has challenged me with the task of assembling a group of mathematicians, some bits of cardboard and string, and a video camera, and attempting to determine the exact value of π, for your entertainment. If you reckon you too can ineptly compute a value in the region of π (in particular, if you can get a more accurate approximation than the date of π day itself, which gives 3.1415), feel free to join in the challenge and see how close you get. Since the British Science Festival’s programme of events for the 2014 festival is now online, you can search through it to find all the mathematical/maths-related events which will be taking place this September in Birmingham. But this is a full-service maths blog, and so you don’t have to because we’ve done it for you. (If you’d rather take a look yourself, the full listing is on the BSA website).